The difference between the two sides has been the Swans ball sue from clearances. They have generated an additional 6.4.40 from this source. The midfield trio of Kennedy, Newman and Parker have been the primary contributors to this cause. They have collected 105 disposals, won 20 clearances and each had 7 score involvements. Although the Kangaroos have won the tackle count by 27, they have been second to the ball. The Swans lead the contested possession count by 34 tonight. North Melbourne has had the upperhand in this quarter, but it is has come too late. 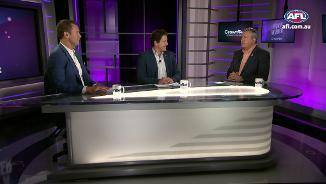 They are winning the time in forward half by 38 per cent and have created 4 more inside 50's, but their goal kicking accuracy is just 40 per cent. Luke Parker has won a gamehigh 9 clearances and 393 metres gained. In the forward half, Dean Towers has had 9 score involvements for the game. The Kangaroos have now launched 3.2.20 from 29 chains beginning in their defensive 50. But, have been able to generate a score from 22 defensive midfield chains. North's tackling pressure has been significant this quarter, they are winning the count 13 to 2 and as result, they have created two goals from intercepts. As the game has progressed, the Swans have found it easier to transition and their lead has grown as a result. They have kicked 7 of the last 9 goals and four of their last nine have been launched from their defensive half. Ben Cunnington has arguably been the most influential player for the Kangaroos around the stoppages. He has 17 disposals, including 8 clearances and 3 inside 50's. North Melbourne had created eleven intercepts for the quarter, but that chain was just their first for the quarter from this source. North Melbourne have created four inside 50's from nine defensive half chains. However, three of these chains have been intercepted and they are yet to create a score from this source. The Swans are winning the centre clearances by 7 and have launched 2.2.14 from this sources. Sydney have the advantage in the midfield area of the ground. They have won 68 more disposals, created 9 more intercepts and launched six goals to one from this area of the ground. Josh Kennedy has won a careerhigh 26 first half disposals as well as 5 clearances, 4 inside 50's and 8 score involvements. Since the 26 minute of the 1st quarter, the Swans have been dominate. They have won 6 more clearances, 27 more contested possessions and launched 5 more scores from stoppages. The Kangaroos have launched 10 fewer inside 50's, but once inside they have been very efficient. They have generated 4.3.24 from just seven forward half chains. Lance Franklin and Luke Parker are having influential quarters with 5 and 4 score involvements respectively. They have also combined for 17 disposals, 445 metres gained and 7 inside 50's. The Swans have taken control of this quarter; winning the clearances by 4, inside 50's by 6 and launching a score from 64 per cent of entries. 6 of these scores have been launched from stoppages. 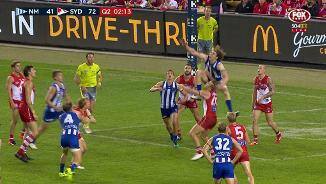 North Melbourne continue to keep in touch due to their ability to punish the Swans turnovers. They have launched a goal from 20 per cent of their intercept chains. Sydney are locking the ball in their forward half and it is paying dividends. They have created 7 more inside 50's and lead the time in forward half by 10 per cent. This has allowed them to create 5 goals from forward half chains. The Kangaroos have applied 12 more tackles and this pressure has created scores. They have launched 4.2.26 of their score from turnovers ,compared to just 2 goals for the Swans. Kangaroos InterchangeJy Simpkin and is possibly out for the game. North Melbourne has created 3 less defensive half intercepts. But have been more effective at transitioning, launching two more goals from intercept chains sourced in this zone. Sydney have won the centre clearances 6 to 3 and launched an inside 50 from 100 per cent of these chains. As a result, they have generated 1 goal directly from this source and 2 from chains sourced in their forward 50. North Melbourne have been more effective from intercepts to start the game. They have generated 13 intercepts and launched 3.2.20 including two goals from forward 50 intercepts. Josh Kennedy has led the way for the Swans with a quarterhigh 11 disposals, 3 tackles and 3 inside 50's. Whilst, Nic Newman has been influential in the forward half with 8 disposals and 3 score involvements. Kangaroos InterchangeJy Simpkin off due to an injury. The Swans continue to be efficient in the forward half with a kicking efficiency of 71 per cent. They have dominated the inside 50's 9 to 2 and launched a goal from 30 per cent of these entries. Sydney is transitioning well from their defensive half. They have created 3 inside 50's and 1.1.7 from 6 chains generated from this zone. Sydney are using the ball well early with a kicking efficiency of 88 per cent. 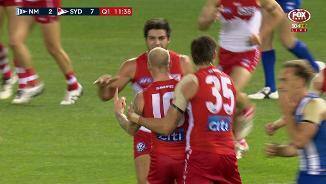 They have created two marks inside 50, including that mark and goal to Sam Reid. Over the past three weeks, Sydney has found a mark from 25 per cent of its kicks inside 50. They are ranked No.1 in this period of time. North Melbourne has scored 55 per cent of its goals from a set shot this season. This is the highest percentage recorded by a side. Welcome to Etihad Stadium for the North Melbourne v Sydney Swans Round 8 clash. THE RUTHLESS Sydney that was so puzzlingly missing in the first six rounds of the season returned in force on Sunday, as the Swans breathed life into their spluttering season with a dominant 42-point win over North Melbourne at Etihad Stadium on Sunday. After opening its winning account against the Brisbane Lions last Sunday, the Swans' second consecutive victory, after starting the season 0-6, has the potential to put them back in the finals framework. Thanks in large part to star midfielder Josh Kennedy, who had 26 disposals to half-time, the Swans seized control of the match in the second term as they used a four-goal burst in seven minutes to bust the game open and take a 26-point lead into the main break. The Swans finished the match with seven goals to North's four after half-time, running out 18.12 (120) to 11.12 (78) winners. Kennedy's influence quietened slightly after the major break, although he still finished with a match-high 37 disposals to be the most dominant player on the ground. 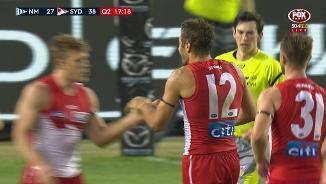 The Swans, who rely so heavily on their stacked midfield to get them going, were switched on from the beginning and signalled their intent around the footy. Sydney established control around the stoppages – leading the contested possession count 169-134 – and spread the field from there, as their swift ball movement, also missing in the early part of the season, made a welcome return. 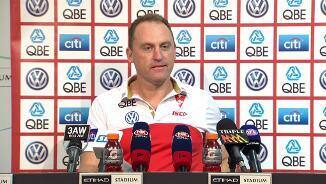 "We were very good," Swans coach John Longmire said. 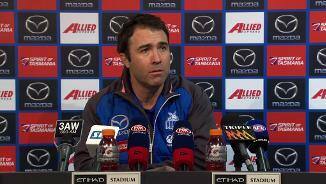 "A mixture of our contested ball and advantage in the uncontested ball was spot on. If you get those two areas of your game right, it means you’re hard inside and you’re running on the outside. The combination of both those aspects was really pleasing." Down on form after interrupted pre-seasons, star duo Luke Parker (36 touches and 11 clearances) and Dan Hannebery (33 and two goals) were instrumental in congested situations for the Swans. As was Isaac Heeney (25 disposals and two goals), who missed the first month of the season with glandular fever. The Swans youngster's ability to play multiple roles through the midfield and up forward emphasised why his presence was so sorely missed during the Swans' abysmal start to the year. Youngster Nic Newman (35 disposals) also made the most of his last-minute call-up in place of Oliver Florent. Missing Jarrad Waite in attack, due to a one-week suspension for a dangerous tackle, the Kangaroos' forward line lacked the bite that set up their upset 59-point win over Adelaide in Hobart last weekend. Lachie Hansen spent time down there alongside Ben Brown, but the two North key forwards managed just three goals between them as the Kangaroos struggled to find a main avenue to goal. North's midfield also lacked the spread that was so clearly present against the Crows, with Ben Cunnington (27 disposals), Sam Gibson (25) and Jack Ziebell (22) winning a bit of the footy but exerting little influence. Kangaroos coach Brad Scott was disappointed with his team's ability to nullify Sydney's best ball winners. "We got obliterated around the ball and then we allowed Sydney to control it (the football)," Scott said. "There were a few patches of the game where we played it the way we wanted it to be played and the rest, Sydney, to their credit, set it up well – won the ball in the contest and dictated terms. "It could've been a lot worse to be honest." Shaun Higgins (21 disposals and six inside 50s) was creative but had few teammates able to produce in similar fashion. Key defender Robbie Tarrant was probably North's best player, as his ability to hold his own in one-on-one contests against Swans superstar Lance Franklin (who kicked one opportunist goal in the final term) stood out. Franklin may also face scrutiny from the Match Review Panel for high contact on North youngster Sam Durdin in the third term. The Swans knew the stakes were high and melees at quarter-time, half-time and three-quarter time emphasised the feeling in the contest. Sydney's tasks do not get any easier with a match-up against the Saints to come next, but for now there is a semblance of normality to its season. North Melbourne: Top draftee Jy Simpkin received treatment on his right shoulder in the first quarter. He returned with his shoulder taped, but it was clear he was not right. The Kangaroos ruled him out of the game late in the second term, with coach Brad Scott saying they were not prepared to take a risk in getting him back out there. Simpkin was seen after the game in a sling and the Roos will assess his injury during the week. Sydney: Swans veteran Jarrad McVeigh spent a lot of time forward after appearing to tighten up in the hamstring early in the first quarter. 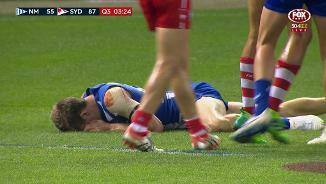 McVeigh had more treatment on his right hamstring at the start of the second term. Defender Nick Smith copped a significant corked leg late in the second term. Ruckman Sam Naismith was also sporting an ice pack on his left knee on the bench in the final term. The Swans fly back to Melbourne to face the in-form Saints in what will be an intriguing contest at Etihad Stadium next Saturday. 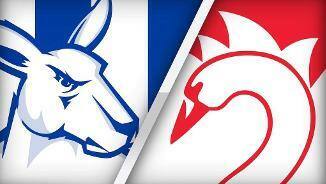 North Melbourne face the Demons, coming off a 41-point win over ladder-leader Adelaide.